Although it did not possess the performance or the firepower of one of its German counterparts, the Heinkel He 219 Uhu night-fighter, the Black Widow was still an immensely potent and impressive night-fighter with the additional advantage of being able to undertake the nocturnal intruder role with a very heavy disposable load. The origins of this formidable night-fighter and night intruder can be traced to the autumn of 1940, when a team of officers from the US Army Air Corps, which became the US Army Air Forces in June 1941, visited the UK to learn about British night interception techniques using Bristol Blenheim Mk IF extemporised night-fighter that was about to be supplanted by the Bristol Beaufighter Mk IF with AI.Mk IV air interception radar. The USAAC realised for the first time that night-fighting was about to become a major element in the air war of World War II and set about the creation of an American night-fighting capability. In the short term the best that could be achieved was an extemporised type, the Douglas P-70 Havoc based on the A-20 attack bomber, but for the longer term the USAAC fully appreciated that a purpose-designed type would be essential. In October 1940 an outline requirement was communicated to John K. ‘Jack’ Northrop, and a mere two weeks later Northrop and his chief assistant, Walter J. Cerny, visited the the headquarters of the USAAC’s Air Matériel Command at Wright Field, which was located outside Dayton, Ohio, to present the results of their initial thinking. Discussions with the appropriate USAAC officers proved most stimulating, and in December 1940 Northrop offered a full design to the Air Material Command. This resulted in a January 1941 order for two XP-61 prototypes. The N-8A design was singularly advanced, and based on a twin-engined powerplant and an all-metal airframe that was very large by the fighter standards of the day. The core of the structure was the central nacelle and wing centre section. The nacelle was of light alloy semi-monocoque construction and carried the crew, air interception radar and much of the armament, the last consisting of four 20 mm fixed forward-firing cannon in the wing’s leading edges and six 0.5 in (12.7 mm) Browning machine guns with 500 rounds per gun in a power-operated four-gun dorsal barbette and power-operated two-gun ventral barbette: the barbettes could be locked to fire directly forward under control of the pilot, or unlocked for use defensively as trainable weapons under the remote control of the gunner. The shoulder/mid-set and slightly dihedralled wing centre section was of light alloy stressed-skin construction and of the constant-chord type. Installed under the outer ends of this centre section were the nacelles for the two wing-mounted engines and their fuel supply, and these nacelles were extended rearward as light alloy semi-monocoque booms that supported the tail unit of two vertical surfaces, each with a rudder, separated by a constant-chord horizontal surface with a single elevator. The flying surfaces were completed by the outer wing panels, which were set at a less acute dihedral angle than the centre section, and were tapered in thickness and chord; virtually the whole of the trailing edges was occupied by small outboard ailerons supplemented by spoilers, and long-span inboard flaps that were originally of the Zap type but later of the slotted type. The airframe was completed by the tricycle landing gear, which comprised a nose wheel unit that retracted rearward into a door-covered bay the underside of the central nacelle below the cockpit, and two main wheel units that retracted rearward into door-covered bays in the nacelles behind the engines. The selected powerplant was two Pratt & Whitney R-2800-A5G (or R-2800-25 in USAAC terminology) air-cooled 18-cylinder two-row radial engines each rated at 2,000 hp (1491 kW) at optimum altitude and intended to drive a four-blade Curtiss Electric metal propeller of the constant-speed type or, pending the availability of this propeller type, a four-blade Hamilton Standard Hydromatic metal propeller of the constant-speed type. In April 1941 a USAAC team inspected the XP-61 mock-up and asked for several changes, including the relocation of the cannon from the wing’s leading edges to the underside of the central nacelle, and the elimination of the ventral barbette. The USAAC team’s reasoning for the elimination of the ventral barbette was that it would improve the airflow over this part of the airframe and simplify the night-fighter’s maintainability, but the change meant considerable revision of the central nacelle’s structure. Various other considerations then added further delays, but in September 1941 the USAAF ordered an initial 150 production aircraft and in February 1942, shortly after the USA’s entry into World War II as a result of the Japanese attack on Pearl Harbor and the Philippines on 7/8 December 1941, contracted for a further 410 aircraft. The first XP-61 recorded its maiden flight on 21 May 1942, and in its subsequent manufacturer’s trials revealed generally good handling characteristics and impressive performance, although considerable concern was expressed about the reliability of the R-2800 engine even in its improved R-2800-10 version. The second XP-61 was completed in November 1942. The SCR-720 radar was installed after the aircraft had been delivered for their official trials, and after a number of additional modifications had been made the XP-61 was accepted as the basis for the production model. Soon after the issue of the initial prototype contract, the USAAC had ordered 14 YP-61 aircraft (one for static trials and the other 13 as service test machines), and these were completed between August and September 1943. The prototypes had been fitted with dummy dorsal barbettes as the General Electric type had not been available for flight trials, but the real unit was installed in the YP-61 aircraft. Trials with this barbette revealed major buffeting problems when the guns were elevated or the barbette traversed. As a temporary measure, pending the completion of wind tunnel tests designed to yield as long-term solution to the problem, the barbette was stripped of its two inboard guns and reinforced structurally. Before the solution to the buffet problem could be found, however, the first of 200 P-61A Black Widow production aircraft were leaving Northrop’s construction facility. The first aeroplane was delivered to the USAAF in October 1943, and while the initial 37 aircraft were delivered with the four-gun barbette locked to fire straight ahead, the following 163 aircraft were delivered as two-seat aircraft without the barbette, although this unit was retrofitted in some aircraft after the solution to the buffet problem had been found. 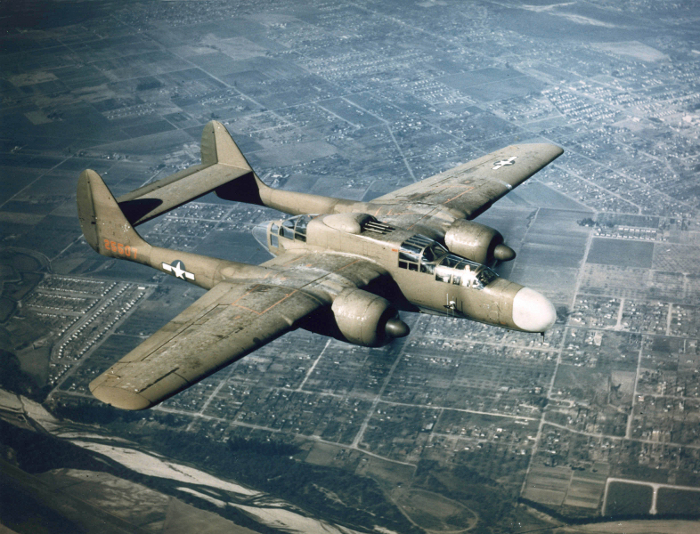 The P-61A was dimensionally identical to the P-61B definitive variant with the exception of its length of 48 ft 11 in (14.91 m), but differed in details such as its empty weight of 20,965 lb (9510 kg), normal take-off weight of 27,600 lb (12519 kg), maximum take-off weight of 34,200 lb (15513 kg), maximum speed of 320.5 kt (369 mph; 594 km/h) at 20,000 ft (6095 m) declining to 289 kt (333 mph; 536 km/h) at sea level, maximum cruising speed of 277 kt (319 mph; 513 km/h) at 20,000 ft (6095 m), economical cruising speed of 194.5 kt (224 mph; 360.5 km/h) at 10,000 ft (3050 m), climb to 15,000 ft (4570 m) in 7 minutes 36 seconds, service ceiling of 33,100 ft (10090 m), maximum range of 1,650 nm (1,900 miles; 3058 km) with external fuel, and typical range of 877 nm (1,010 miles; 1625 km) with internal fuel. The first 45 aircraft were delivered with the powerplant of two R-2800-10 engines each rated at 2,000 hp (1491 kW) at optimum altitude, but the next 35 were completed with the powerplant of two R-2800-65 engines each possessing a combat contingency rating of 2,250 hp (1678 kW) at 1,500 ft (760 m), and the later 100 aircraft were completed with a powerplant of engines modified with a water-injection system. Among these last 100 aircraft were 20 with two underwing hardpoints each able to carry one 1,600 lb (726 kg) bomb or 310 US gal (258.1 Imp gal; 1173.5 litre) drop tank. The P-61A entered service in the middle of 1944 in Florida, where the 481st Night-Fighter Group was established as the parent of the 348th, 349th and 420th Night-Fighter Squadrons, and in the UK where the 422d and 425th Night-Fighter Squadrons re-formed in the type. The first sorties were flown from the UK in July 1944, but it was in the Pacific that the P-61A first drew blood in the same month when a P-61A of the 6th Night-Fighter Squadron claimed a Mitsubishi G4M ‘Betty’ bomber of the Imperial Japanese navy air force in the central Pacific. A steady increase in the number of operational squadrons was possible as teething problems with the P-61A fighter and its temperamental radar were eliminated, and soon the type was operational in Europe, the Pacific, New Guinea and China. Even before the P-61A entered operational service, however, Northrop had started deliveries in July 1944 of the P-61B Black Widow with a number of improvements including an 8 in (0.203 m) lengthening of the nose. Deliveries amounted to 450 aircraft, and progressive improvements effected during the course of the P-61B’s production run included four underwing hardpoints each able to carry one 1,600 lb (726 kg) bomb or 310 US gal (258.1 Imp gal; 1173.5 litre) drop tank on the P-61B-10 block onward, the four-gun dorsal barbette from the P-61B-15 block onward, and a new General Electric barbette with a revised fire-control system on the P-61B-20 block onward. Some 12 of the aircraft were later transferred to the US Marine Corps, which used them as night-fighter trainers with the revised designation F2T-1N. Although operational pilots were happy with the firepower, very considerable agility and generally good performance of the P-61A and P-61B, they were also somewhat critical of these two variants’ speed and climb. Northrop therefore evolved the P-61C Black Widow with the powerplant of two R-2800-73 engines each rated at 2,800 hp (2088 kW) with General Electric CH-5 turbochargers and driving a Curtiss Electric propeller with four hollow blades. This uprated powerplant resulted in a maximum speed of 373 kt (430 mph; 692 km/h) at 30,000 ft (9145 m) and a service ceiling of 41,000 ft (12495 m) even though the normal and maximum take-off weights had increased to 32,200 and 40,300 lb (14606 and 18280 kg) respectively. The increase in maximum speed was particularly notable, and raised fears that the P-61C might overhaul its targets too quickly and would therefore be unable to fire before it had passed the enemy aeroplane, so the type was fitted with air brakes above and below the wings. Some 41 of this version had been completed by the time of Japan’ defeat, whereupon another 476 were cancelled. This ended production of the P-61 series. The XP-61D Black Widow was a development model with the powerplant of two R-2800-77 turbocharged engines. The XP-61E Black Widow was created in an effort to pioneer a variant of the Black Widow for daylight operations with higher performance and longer range. The XP-61E was thus an experimental version of the P-61B with the nose radar replaced by four 0.5 in (12.7 mm) Browning machine guns for unaltered firepower despite the deletion of the dorsal barbette. The upper part of the central nacelle was also cut down to the level of the wing’ upper surface, additional fuel tankage was incorporated in the central and rear portions of the central nacelle, and the accommodation was revised to two men in tandem in a cockpit enclosed by a blown clear-view canopy: on the first of the two XP-61E prototype conversions from P-61B standard the canopy was hinged to open sideways, and on the second (written off in a take-off accident during April 1945) the canopy was designed to slide to the rear. The data for the XP-61E included a span of 66 ft 0.75 in (20.14 m) with aspect ratio of 6.59 and area of 662.36 sq ft (61.53 m²), length of 49 ft 7 in (15.11 m), height of 14 ft 8 in (4.47 m), empty weight of 21,350 lb (9684 kg), normal take-off weight of 31,425 lb (14254 kg), maximum speed of 326.5 kt (376 mph; 605 km/h) at 17,000 ft (5180 m), climb to 20,000 ft (6095 m) in 13 minutes 0 seconds; and normal range of 2,214.5 nm (2,550 miles; 4104 km). The XP-61F Black Widow was an experimental version of the P-61C to XP-61E standard. The designation P-61G Black Widow was allocated to 16 P-61B conversions for the unarmed weather reconnaissance role. The XF-15 Reporter was the unarmed photo-reconnaissance version of the Black Widow with the powerplant of two R-2800-C engines each rated at 2,100 hp (1566 kW) under normal conditions but with 2,800 hp (2088 kW) available for emergency use. Like the R-2800-10 engines of the P-61, these units each drove a four-blade Curtiss Electric metal propeller of the constant-speed type, although in this instance the diameter of the propeller was increased from the figure of 12 ft 2 in (3.71 m) in the P-61 to 12 ft 8 in (3.86 m). The type was evaluated in the form of a single XF-15 prototype conversion from XP-61E standard. The XF-15A Reporter was a prototype conversion from P-61C standard along the lines of the XF-15, and like the XF-15 had six cameras (of up to 11 types in a maximum of 24 arrangements for the forward, vertical and oblique photography tasks) in a modified and lengthened nose. The success of the two prototype machines in flight test programmes that started in January and February 1945 respectively paved the way for the F-15A Reporter production model, of which 36 were completed and 139 more were cancelled out of an original order for 175 aircraft. The F-15A was dimensionally similar to the P-61 in all but its overall length of 50 ft 3 in (15.32 m), and otherwise differed in its accommodation for only the pilot and co-pilot/navigator in tandem in a cockpit enclosed by a long clear-view canopy with a large rearward-sliding section for access and egress, loaded weight of 28,000 lb (12701 kg), maximum speed of more than 382 kt (440 mph; 708 km/h) at optimum altitude, service ceiling of more than 35,000 ft (10670 m), and maximum range of more than 3474 nm (4,000 miles; 6437 km) with drop tanks. On the night of 14 August 1945, a P-61B of the 548th Night-Fight Squadron named Lady in the Dark was unofficially credited with the last Allied air victory before VJ Day ended World War II. After the war, the Black Widow, redesignated from the P-for-Pursuit to F-for Fighter category as the F-61 Black Widow, served in the USAAF (from 18 September 1947 the US Air Force) as a long-range, all weather, day/night interceptor in the hands of the Air Defense Command until 1948, and the 5th Air Force until 1950.